LG has begun the release of its latest smartphone, but you may have to wait a little while if you live outside of the US. Those who have pre-ordered the dual-screen phone in the US will receive it from today (and you can buy it in the shops) but the UK and Australia may have a little longer to wait. LG has confirmed it'll be coming to these markets before Christmas. 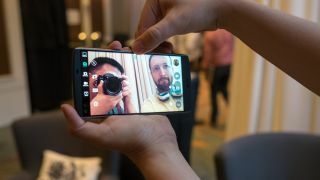 The LG V10 has a dual-screen on the front with a miniature 2.1-inch display running along the top of the phone for notifications, as well as a normal 5.7-inch QHD IPS Quantum one below. The front camera on the phone has also been doubled up so you can get 80 degree selfies or wide-angle shots of 120 degrees around. On the back is a 16MP camera and under the hood is a Qualcomm Snapdragon 808 processor with 4GB of RAM and 64GB of internal storage. Add in a 3000mAh battery and microSD support up to 128GB and you're looking at a decent little phone.